Utopian Classic! Set in the year 2000, the book is a futuristic novel of three utopias: a Christian heaven on Saturn; an Eden-like new world on Jupiter; and a technologically-oriented, libertarian paradise on Earth. John Jacob Astor, the great-grandson of the famous financier, was one of the wealthiest men on earth, with assets of $100 million (compared to J.P. Morgan, who had only $30 million). Astor was an inventor (of a bicycle brake, a storage battery, an internal combustion engine, a flying machine, and a marine turbine engine) and also co-founder of the Waldorf Astoria Hotel in NY. His fascination with science led him to begin writing his only novel, A Journey In Other Worlds when he was 28 years old. He lost his life in the Titanic disaster, leading his wife to a lifeboat but returning himself to the doomed ship. 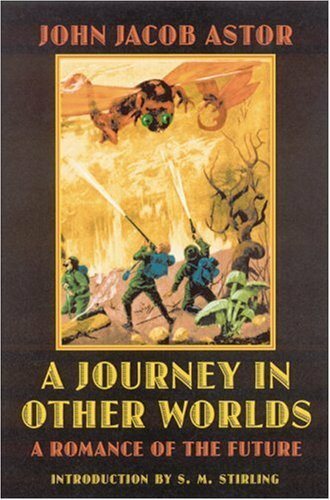 Astor's novel, with descriptions of an antigravity device, aeroplanes, television and space travel was widely read and became a bestseller on publication in 1894.